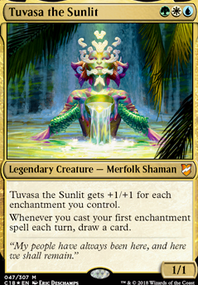 Tuvasa Voltron Deck - Extra emphasis on dealing lethal damage with Tuvasa the Sunlit. The plan is to deal even more damage with her using stuff like Battle Mastery and Auramancer's Guise and we're taking extra measures to protect her with things like Vanishing and Shield of the Oversoul. Even if she does get shut down, we have plenty of backup creatures to finish the job.